Water damage can unfortunately occur in any home, and no matter where it happens it must be remedied immediately to avoid further damage and costs, which is why 911 Restoration Chicago is standing by around the clock and available 24/7 to expedite our highly capable mobile crews of water removal experts to the site of your emergency. Our water damage technicians truly care about Des Plaines and all of its wonderful residents which is why we offer our water damage services with a signature same day service, free inspection and we will respond within 45 minutes of your call, because in a water damage emergency, quick responses are absolutely critical to avoid increased destruction and costs associated with the repairs. Our water damage Des Plaines pros know that the city has had a long and serpentine history of stewardship from Native American tribes to entrepreneurs who have utilized the city’s proximity to Chicago and its position on the Des Plaines River for business and industry. It is home to the first McDonld’s franchise, became the picturesque backdrop for many John Hughes movies, and was even highlighted in the “Left Behind” novels. Residents of Des Plaines are proud of their heritage, though they don’t want to get left behind when water inundates their homes and businesses which is why 911 Restoration Chicago is here around the clock to stem the flow of any water damage situation before residents have to take planes, trains and automobiles to escape the rising waters. So if you have water damage in your Des Plaines home, or if you want to know who to call for a toilet overflow, then give our experts at 911 Restoration Chicago a call today! Sewage back flow valve reconstructions. Our water damage Des Plaines pros use the latest drying technology. Our water damage Des Plaines masters know that a toilet overflow may seem like a situation that you can take on by yourself without any professional assistance, but that is not the case in all instances. Many times homeowners miss sections of the black water that they are trying to mop up, and when it seeps into drywall and under floor boards it can create a toxic environment that harbors the growth of mold spores and fungus infestation which can pose a health risk to you and your family. Once inhaled mold spores can cause congestion and even respiratory problems in those who are old, young, or that have damaged immune system responses. So if you have a toilet overflow situation, or if you just want to know if water removal is affordable, then give our experts at 911 Restoration Chicago a call now! Our water damage Des Plaines technicians know that water removal can be extremely affordable if you notice the problem quickly and if you choose reputable and skilled professionals like ours at 911 Restoration Chicago to handle the repairs for you. The longer water stands and is allowed to pool the more damage it will cause in the long run. As water seeps into the structure supports of your home, it will eventually begin to weaken its integrity and will eventually cause a failure that may put your life and that of your family at risk. The Insurance Information Institute has statistics that show water damage is the second most frequently claimed loss by homeowners, and that means there is an strong likelihood that it can happen to you. In any case, our water damage Des Plaines experts are working with all insurance companies to provide our customers with the most comprehensive restoration services and all at the most affordable price possible. So if you have water that needs removal from your home, or if you just want to be highly prepared by knowing what the best restoration company in Des Plaines is before you have any flooding, then give our experts at 911 Restoration Chicago a call today! What Is The Best Restoration Company In Des Plaines? Our water damage Des Plaines specialists have over 35 years of experience as the industry leaders in all forms of restorations and that coupled with our ability to always put the customer first makes us the best restoration company in all of Des Plaines or the surrounding area. We value professionalism and that’s why we are licensed, insured and bonded to provide not only excellence in care, but also peace of mind to our customers who can sleep soundly knowing that their home restoration is in the best hands in the business. We aren’t just the best restoration company in the Chicago area because of our decades of experience, but also because we truly care about the city of Des Plaines and all of its people. We pride ourselves on always getting our clients back into their homes as quickly as possible, as safely as possible, without cutting any corners. 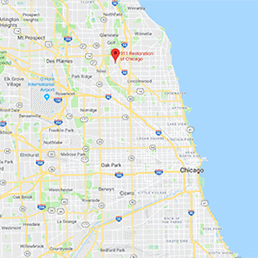 So if you have water damage and you’ll settle for nothing less than the best restoration company in the entire Chicago land area, then give our experts at 911 Restoration a call today!